Hey everyone. I'm here at Jordan-Hare Stadium, where your Auburn Tigers will begin their celebrated scrimmage in a matter of minutes. I'll be updating throughout the day if something strikes me. I don't anticipate a lot of front-line guys, people you really care about, to be on the field more than 20 minutes. That's the reality of A-Day. There will be a new Justin Fetsko crowned today. I wonder who wins this time. 2007 season awards were given out prior to the scrimmage. There were a few upsets. The first half was a mixed bag of offensive goodness/badness. Some good plays. Some bad plays. I thought Kodi Burns played a little better than Chris Todd, though Todd was really good during his final drive of the first half. He completed 6-of-7 on the drive to get his team to the 1. Then they started running. The drive ended with a missed field goal. The score is Blue 23, White 0. Hey everyone. It was another sunbeamy morning on the Plains as the football team worked for approximately two hours. Lots of collisions and unhappy coaches as you'd expect. First, we're ecstatic that you chhose to spend a March average of 52 seconds per day here at the HOTTEST Auburn blog on the 'net. **Nall stopped the drill after the second snap to tell Eddins: "You're waiting for him to make the first move. It doesn't work like that." Then Eddins held his own during the next snap. It's that easy. *move of the day = Clayton began by faking outside, then he cut inside and cut off Isom with a swim chop. It was ideal execution. How ideal? Isom, a good player, stopped moving once Clayton made the chop. There was no way to gussy up that mess. The hit of the day came during the final 30 minutes when OLB Chris Evans sniffed out a screen pass and clobbered TB Ben Tate as he caught the throw. Tate was planted on his back. To his credit, Tate popped up and congratulated Evans on the play. "That was nice of him to think of me there," Evans said with a smile. TB Tristan Davis returned to practice after missing three weeks because of a troublesome toe. He broke the toe last season, then sustained a bruise in the same area during Auburn's second spring practice. Davis, who didn't participate in full-contact drills Thursday, said he's planning to play in the A-Day game. I saw DE Antonio Coleman (neck) after practice. He said doctors in Birmingham gave him full medical clearance on Tuesday, but suggested that he skip the team's remaining three practice days as a precaution. Coleman was bummed about that. DT Jake Ricks was back on the field Thursday, though he didn't participate in any drills. The sophomore broke his right hand during practice two weeks ago and now is wearing a black cast that runs from his knuckles to mid-forearm. OC Tony Franklin reiterated his stance on QB Neil Caudle, who was dropped from the quarterback race on Tuesday. Caudle spent part of his Thursday morning communicating plays from the sideline. That's the Franklin System equivalent of holding a clipboard. ``He's an Auburn guy. He loves Auburn," Franklin said. ``He's a student first, which is what you're supposed to be. He's in the major he wants to be in. He knows what he wants to do in life and he wants to be a quarterback, too. He's a team guy and he understood that I had to pick somebody. I just had to make a decision to try to give the other guys reps. In all honesty, it was a feel thing as much as it was anything. He's as good as any kid I've been around." I should have mentioned this the other day. I've been playing a lot of Rock Band lately because it's something my lovely lass and I can accomplish cooperatively online. She's not a big Call of Duty fan like me, so it's nice to get her involved. Anyway, Harmonix/EA released a six-song Boston pack on Tuesday. 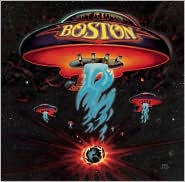 Combine those six with "Foreplay/Long Time," a track that's available in the game, and you have seven of the eight tracks that comprise the 70s band's first (and best) album. I'm so totally geeked about this. I knocked out "More Than A Feeling" at 98% on expert last night, which is very good for me. The missing track, for you completionists out there, is "Let Me Take You Home Tonight." For those of you who label me a sellout for compromising my Guitar Hero ideals for this girly game, well, maybe you're right. I'm having fun. Rock Band is easier, too. AS ANY BOSTON FAN WOULD ... let me give an R.I.P. to lead signer Brad Delp, who committed suicide last year after a long struggle with depression. Hey everyone. We had an interesting moment earlier today. 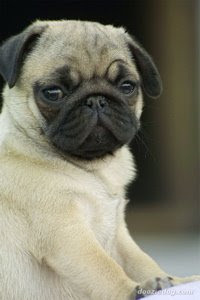 My wife loves pugs, I mean LOVES 'em, and we happened upon a great-looking pug at Petland today. My wife checks him out. She likes him. I'm getting ready to drop the requisite $500. You know how it goes. Then I'm saved at the last minute. The Petland employee announces that the dog costs $1,499. Instant extrication. Woo-hoo. God bless you, Petland, for your ridiculous pricing scheme. In other news, someone told me that Barry McKnight's sidekick was playing the 'ol Who is Jay G.? game on WMSP radio today. That's another bit of mine shamelessly stolen without attribution. I can't believe a single innovative thought has passed through that guy's lips in 10 years. I certainly haven't heard it. I wonder if the obvious success of The Roundtable (WMSP's afternoon show) eventually will force some improvements to the morning show? As it stands, I feel like I'm listening to tapes from 1998 every morning. It's real-life Groundhog Day. Coach Tommy Tuberville's influence continues to spread. Auburn's football coach has agreed to spend time in May touring military bases in the Middle East. He'll be joined by Mark Richt (Georgia), Randy Shannon (Miami), Charlie Weis (Notre Dame) and Jack Siedlecki (Yale). They'll kick it with troops, coach some flag-football games and participate in a symposium. Hey, Tuberville loves warm locales. He'll get plenty of sun over there. OK, so you all read what OC Tony Franklin said yesterday regarding the quarterback situation. Chris Todd and Kodi Burns allegedly are in a dead heat. I dont believe that. I believe that Todd is The Guy, provided he's healthy, and Burns will be the second guy until he learns to repeat solid mechanics. Burns is not throwing well right now. A surprising percentage of his passes, I'd say 30% or so, are really wobbly. Many more are not placed well in relation to where the receiver needs them. Burns has a long time to improve. I know that. I'm not knocking the kid. I'm just telling you that he doesn't look like a dominating quarterback right now. Hey everyone. It was a cold morning out there on the turf, though I'm not complaining. I was wearing my Russian bomber hat, a cashmere scarf and some gloves my gal snagged for me at the dollar store. I was ready. First, though, I'd like to thank you for making this the HOTTEST Auburn blog on the 'net. The football team held a two-hour workout this morning. The most memorable thing I saw were some pretty vigorous post-practice (punishment) drills required of all defensive players. They held an extended fumble drill and did some other not-so-fun things ... all with DC Paul Rhoads barking less-than-encouraging words. ``There were signs of rust that were certainly expected," Rhoads said. ``In our profession, you just don't tolerate it, though, whether you expect it or not." TB Ben Tate was back on the field, in full pads, for the first time all spring. He's been out with separate issues with his ankle and hamstring. Counter to earlier reports that suggested Tate won't participate in A-Day, Tate said: "Of course I'm going to scrimmage. I feel good. I'm not going to pass that up." Tate said he was 95% back from his injuries. OC Tony Franklin disagreed. ``He didn't look back to me. I thought he just kind of ran through the motions, and was just there," Franklin said. ``I was glad to see him, but he's nowhere close to being back as far as I'm concerned. Maybe he will be. Hopefully he'll be able to get some reps by the time we get to Saturday, but he didn't look like the guy I saw in the bowl game." More hard times for QB Neil Caudle, who was seen Tuesday signaling plays from the sideline. Franklin said he has decided to concentrate on Kodi Burns and Chris Todd during these final five practices. Franklin said Caudle will "be a great backup for them." So it goes. Maybe Caudle can play baseball. There was a change on the defensive depth chart. Aairon Savage bumped Walt McFadden out of the top spot at one of the cornerback positions. ``I thought Aairon was advancing a little faster than Walt and wanted to see him compete with the ones, both with our guys and against our guys," Rhoads said. QB DeRon Furr resumed throwing drills on Tuesday for the first time in nearly three weeks. The freshman injured his throwing shoulder during Auburn's first spring scrimmage. Franklin said Furr has no chance to play this fall because he can't anticipate. That's not a surprise considering Furr is supposed to be in high school right now. He enrolled a semester early. Assistant coach Hugh Nall said the changes were made only to help those players add secondary positions to their skill set. Pugh absolutely will be back at tackle this fall. Berry said he'd prefer to play tackle. I don't know if that will happen. Below you'll find today's ledger from the one-on-one line drills. I want to note that OG Bart Eddins did a really nice job today of not leaning. He was in great position, paid closer attention to leveraging defenders with his body and, as you'll see below, the results were positive. Hey everyone. Hope you had a swell Sunday. We sure did. 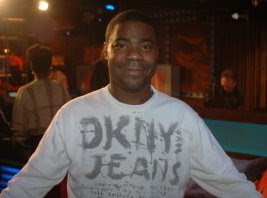 Today's picture is of internationally known superstar Tracy Morgan, currently of "30 Rock" fame, who appeared on The Howard Stern Show this morning. We here at the HABOTN were tearing with laughter at Morgan's hilarious hour-long appearance. Nobody makes me laugh harder than Morgan. I'd give you a run-down of what he said ... but the Advertiser would be very unhappy with the language. I'd consider it laced with adult content as well. In a related issue, the Justice Department today announced that it no longer is investigating the proposed XM-Sirius merger. That means the merger now only has one obstacle left: the Federal Communications Commission. I'll be quite happy if we can get everyone on the same satellite network. I'm a huge enthusiast -- terrestrial radio is just awful these days -- and I want to make sure this medium remains a viable option. Both companies have made it clear that operating separately will lead to concurrent financial ruin. Come on, FCC. Don't be stupid. OK. I know you want Auburn chatter. Here goes. The football team resumes practice Tuesday morning at 7 a.m. I'll be there to give you a blow-by-blow account of all the Things You Need To Know. *The power in QB Chris Todd's arm after a 12-day layoff. *Will TB Ben Tate be on the field? *Can DE Michael Goggans continue his torrid spring. He has been great so far. *Sen'Derrick Marks vs. Tyronne Green in the one-on-one line drills. *And while I'm there: Antoine Carter vs. Lee Ziemba in the one-on-one line drills. *Antonio Coleman's return to full-speed drills: Myth or fact? For you schedule junkies: The team practices Tuesday morning, Thursday morning and Friday afternoon in advance of Saturday's BIG A-Day game/scrimmage/practice. Tickets for the BIG game/scrimmage/practice cost $5 and can be purchased in like 2,000,000 places including the Auburn Ticket Office (not online) or at the gate. A couple of my blogging counterparts, most notably should-be Hall of Famer Phillip Marshall, have noted that Auburn's basketball teams will have "much promise" heading into next season. Really? The women could be very good if PG Whitney Boddie is back (not sure if that will happen) and someone, ie Alli Smalley, emerges as a competent shooting option. I don't think a team like that would be great, per se, but could finish fourth in the SEC ... behind Tennessee, Vanderbilt and LSU. You'd be looking at a 4 seed in the NCAAs. The men? I don't know. Look, we know SF Korvotney Barber and PF Josh Dollard are good players. Who else? PG Quantez Robertson is one of my favorite players to watch, his subtle contributions kept his team afloat this season, but he's not a scorer. Neither is PG DeWayne Reed. SG Rasheem Barrett is inconsistent. I guess junior-college SG Tay Waller could be the designated shooter. It's so strange to me that Auburn doesn't value shooters. Jeff Lebo, the dadgum coach, was a shooter in college. He put up 344 shots from three-point range during his final two seasons at UNC (in 87-88 and 88-89) and hit 41.8% of them. That seemed to help UNC back in the day. Is there no lesson to be learned?